Leaves are getting more attention from others as well yet again; Knitting Daily Newsletter looks at “leaves in stitches”. Amusingly I have also been playing with the idea of shell shapes a la Horst Schultz. 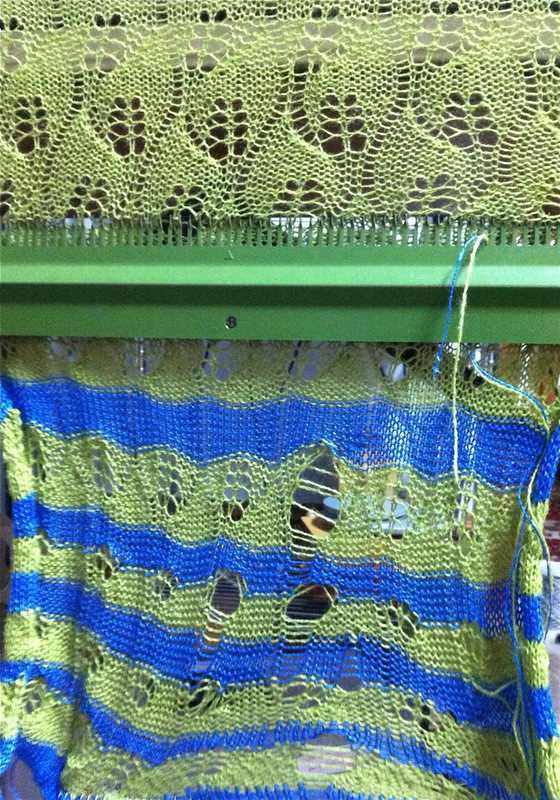 As for my own leaf pattern: here is a wrap in progress on my knitting machine. 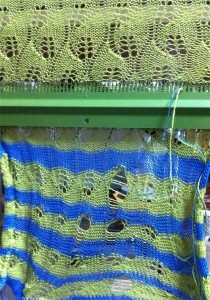 Knitting is slow, with many transfer rows between knit ones. Though I am still using the now familiar silk alpaca blend it took some fussing with weights and tension to avoid the “deconstructed” lace that was not part of my intended pattern. The added success comes from visually checking transfers each row, and increasing skill at sorting out where to put dropped stitches back onto the needle bed. Posted on March 26, 2012 Categories Lace, Machine knitting (MK)Leave a comment on They’re everywhere! Knitting with one’s arm, an interesting cast on and use of a serenity loom, potholder loops meet finger knitting, and automating part of it super large scale. Project big knit at stitches east.